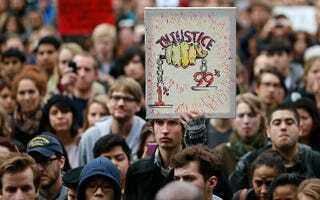 The Occupy Wall Street phenomenon has a thing or two to teach us about, of all things, affirmative action. One of those affirmative-action-all-the-time spells will most likely be on us again — soon. Abigail Fisher has appealed to the Supreme Court in her 2008 case against the University of Texas at Austin — denied by the 5th Court of Appeals — for not admitting her despite an academic record that would have gained a black or Latino applicant admission. Forecasts suggest that the Supremes will likely hear the case before June — unless UTA succeeds with its current strategy of stonewalling in response to the high court's request for a preliminary response to the challenge of its admissions policy. However, that will work for only so long, in which case the decision would happen in late 2012 or soon thereafter. Surely there will be editorials against Fisher's grievance, if the past is any indication, calling attention to the persistence of racism, questioning traditional conceptions of academic merit and pointing out that George W. Bush was a mediocre student and yet became president because of family connections. For black people who support OWS' focus on addressing inequality — and we can assume that is most, despite qualms with OWS' methods — it's time to seriously engage the fact that we do not have a lock on needing action of the affirmative sort. How about speaking up for affirmative action based on inequality among all people, rather than just those with brown skin? Giving people a leg up in admissions policies to acknowledge the obstacles they have faced is fine. But rejecting students on the basis of their not happening to be brown is much trickier to defend. Decisions in favor of such practices, such as 1978's Regents of the University of California v. Bakke and 2003's Grutter v. Bollinger, continue to attract vociferous challenges. And it's too easy to say that the reason for their legal challenges is racism, ignorance or a combination. One might argue that white complainants like Barbara Grutter, and now Fisher, seeking "affirmation" of their hard work, are missing a few points: that America was founded on racism. That black unemployment is higher than white unemployment. That black men have trouble getting cabs in New York. Now, should the child of a wealthy suburban family accept that they might cede their place at a good school to someone who made the best of growing up lower-middle class or below, without access to many Advanced Placement classes or SAT coaching? I say yes, and disagree sharply with anyone who sees no room for addressing societal inequality in this manner. But a preference policy that truly sticks, requiring no sonorous double-talk about squishy notions like "redress" from the left, and attracting no grouchy claims of "reverse racism" from the right, will be one under which all members of the American social contract can be sure that what is being addressed is inequality rather than melanin. To be black is not, after all, automatically to be a poster child of inequality. It's time to get comfortable admitting that these days, not all black students have lived lives that justify admissions preferences — and that those whose lives don't justify affirmative action constitute a vast group. Why should a black student raised by two doctors, or a school principal and a middle manager, be preferred over a white one with better grades and test scores? Watch out for two common responses here. The first is the "diversity" bit. Try telling a black student to her face that she deserves admission for being diverse, and note that she won't like it. Also ask her, if she is a middle-class or affluent black person, precisely what the nature is of the "diversity" she contributes — and then ask the committee admitting her on that basis the same question. Ask the members of that committee to name a single university where race-based preferences were discontinued and admissions of brown students dropped to too few to constitute a community. Having a perceptible and vigorous black community on a campus — even if not as large as it was in the '90s — doesn't require race-based preferences. Sure, lots of middle-class black people today are holding on to that status tenuously. But that brings us back to Occupy Wall Street, which is all about how too many people of all walks in the 99 percent are watching their life's efforts go to naught because of entrenched inadequacies of opportunity and financial skullduggery on Wall Street and beyond. There is not a thing "conservative" about basing college-admission preference policies on class. It is a prototypically progressive position. It is supported by serious intellectuals unconnected with any right-wing ideology and sincerely concerned with racial justice. The reason thinkers such as the Century Foundation's Richard Kahlenberg and New York University sociologist Dalton Conley favor class-based preferences is that the argument makes sense. Nor does supporting preferences based on socioeconomics signal ignorance that racism persists in America. The question is what the relationship between policy and racism must be. The key question is not whether racism exists, then. It is the following: Though racism exists, in the America of 2011 and Occupy Wall Street, are black 99 percenters' problems more important than those of white ones? I suspect that most people, of all colors, will say no here. And it suggests that today's admissions preference policies should give a leg up not just to brown people but to a multicolored segment of the 99 percent. John McWhorter is a contributing editor to The Root.